On November 28, Iranian President Hassan Rouhani and his Russian counterpart Vladimir Putin agreed in a telephone conversation to coordinate steps about global oil and gas prices as well as on the war in Syria. The phone call is the latest indication that relations between Iran and Russia have improved significantly in recent years. And three main factors appear to have contributed to closer diplomatic, military and economic ties between the two countries. First, Moscow and Tehran have had a convergence of interest in supporting the embattled Syrian government of Bashar al-Assad in the past five years. Last month, Russian officials said Moscow was stepping up cooperation with Iran in Syria and was beefing up its naval presence along the Syrian coast. Senior officials from Iran, Syria and Russia frequently hold meetings to coordinate military and diplomatic policies. Second, Moscow’s relations with the United States and European powers in the past years have deteriorated dramatically over Kremlin’s interventionist policies in Eastern Europe and the Middle East. 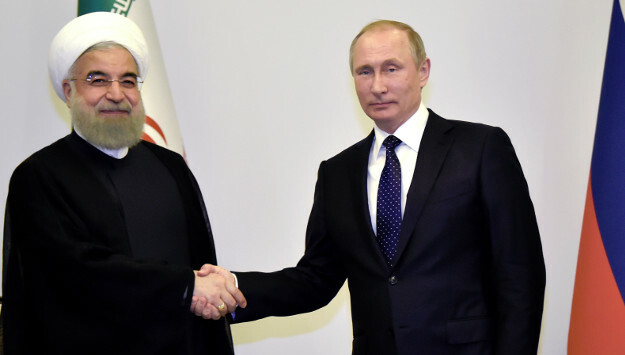 As a result, Putin and in open defiance of the West, has been flirting with Tehran. Third, the lifting of most international sanctions on Iran after the 2015 nuclear deal has allowed Moscow to nurture closer economic and trade ties with Tehran. The volume of bilateral trade in the first nine months of this year has increase by 80 percent to $1.6 billion compared to last year. And the two countries aim to further increase the amount to $4 billion per year. Earlier this month, the two countries begun negotiating the supply of around $10 billion worth of Russian arms and military hardware to Iran. And Tehran said it was planning to sign new, major agreements with six Russian energy giants Gazprom, Rosneft, LUKoil, Gazpromneft, Tatneft and Zarubezhneft by the year’s end. On December 13, a high-level Russian trade delegation led by Energy Minister Alexander Novak will attend a Russia-Iran intergovernmental commission on trade and economic cooperation in Tehran. Moreover, Tehran and Moscow are working on waiving visa requirement for tourists arriving as part of package tours.